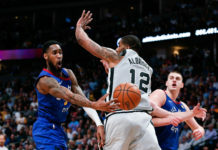 San Diego – Juancho Hernangomez was the forgotten man of the Denver Nuggets last season. 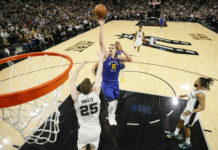 After a stellar rookie campaign where he played in 62 games and hit 40.7 percent of his three-point shots, he completely fell out of head coach Michael Malone’s rotation in 2017-18 after a brutal bout with mononucleosis followed up with him also getting the flu. He ended up only playing in 25 total games and essentially all of his statistics fell off of a cliff. Hernangomez’s terrible luck with illnesses stole his sophomore season from him and sapped most of his confidence. Even through Hernangomez continued to work as hard as anyone in the Nuggets’ locker room, his opportunity to prove himself never materialized during the 2017-18 season which led to him feeling somewhat neglected when game nights came around. He always stayed ready, but he also questioned himself, his role, and how the coaching staff perceived his ability to help Denver. Now, Hernangomez is doing everything he can to force Malone to trust him. Hernangomez desperately needed a game of this caliber. Looking back to the 2017-18 season, Hernangomez’s highest scoring game was just 11 points and it was the only time he reached double-digit scoring all season. After his incredibly rough 2017-18 season, his confidence wavered and he struggled to find any semblance of a rhythm. Jump ahead to the night of September 30th, and Hernangomez finally put together the game he needed. 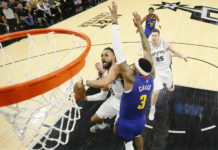 He turned in a 19-point performance that included him hitting five three-point shots while adding three blocks and five rebounds to the mix. Hernangomez ultimately had the strong game he needed and it allowed him to prove to himself and the coaching staff that he can absolutely help the Nuggets throughout the season. Denver’s 124-107 preseason win over the Lakers served as a gigantic confidence booster for Hernangomez. Once Hernangomez saw his shot fall, all of his swagger returned. The bravado and fearlessness that he had originally harnessed in his first NBA season bubbled to the surface. He was confidently stepping into his shots and he was making an impact all over the floor. He even began talking trash in his native tongue to the opposing Lakers players. Everything was going right for him for the first time in nearly 18 months. Once Hernangomez’s confidence retuned, his entire game took off to entirely different heights. He was launching three-point shots with determination and poise. He was defending with vigor and aggression. He was running the floor with intention and focus. Everything Hernangomez did was elevated in a massive way and it all had to do with his increasing confidence and, just as Hernangomez had hoped, he caught the eye of the coaching staff. 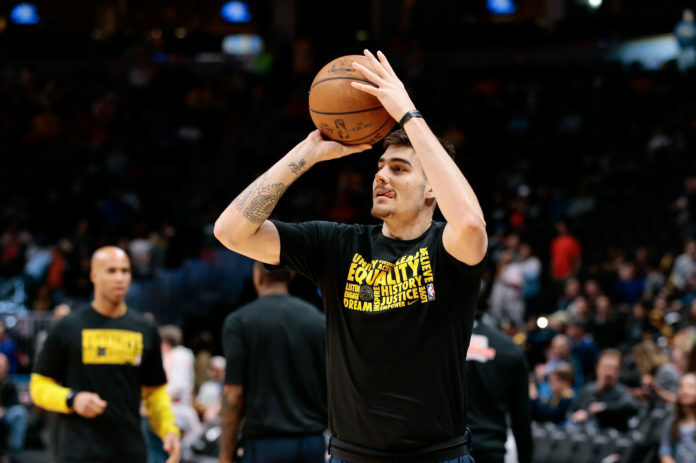 The only difference for Hernangomez is that he was finally able to get onto the court and it led to a much stronger belief in his own ability. No longer is he second-guessing himself when he steps onto the floor. Now, the quick decision making and lightening quick jump shot has returned and it has led to Hernangomez’s proving to everyone who saw him play that he has the ability to be a high-level role player in the NBA. Although, if you ask Hernangomez, he is just doing what he has always done. Nothing about his preparation or training has changed. He just finally received what he wanted all along; an opportunity to help his team claim a victory.